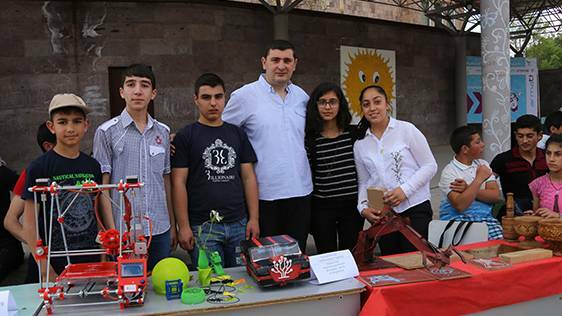 Students of “Armath” engineering laboratory operating in Vayots Dzor marked the beginning of summer holidays in Yeghegnadzor. The aim of this regional meeting was also to create an atmosphere for communication of students, as well as task review. The students of “Armath” laboratories have brought with them the items and robots created with the help of 3D printers during the classes. The event was also attended by the UITE and Ucom employees, as well as businessman Anushavan Abrahamyan and others. Sedrak Vardanyan, “Armath” engineering laboratories coordinator noted that still 1 year ago there had not been a single laboratory in Vayots Dzor, but at the moment already 11 “Armath” engineering laboratories operate in the region, the students of which would display their knowledge and works acquired and created during this 1 year. “For already 3 years Ucom has been supporting the program of implementation of “Armath” engineering laboratories in the RA regional schools. A symbolic summer day has been chosen where we should emphasize the importance of engineering education among children and do our best for the benefit of development of our children,” said Ashot Barseghyan, Head of Brand Development and Communication Unit at Ucom. It’s worth adding that the program of implementation of “Armath” engineering laboratories is carried out by the Union of Information Technology Enterprises (UITE). With the support of the RA Government and other donor organizations, the Union is planning to create an opportunity for all students in the RA to get modern education in engineering. At the moment already 200 “Armath” engineering laboratories are operating on the territory of RA, and Ucom acts as a large investor of this education program. Ucom has already created dozens of “Armath” laboratories and is planning to bring the total number of such laboratories to 70.